Virat Kohli-led Indian Test team beat Australia by a comprehensive 75 runs to level the 4-match series 1-1 as Ashwin registered his 25th five-wicket haul on 7 March. Ripping through the Australian line-up were Ravindra Jadeja and Ravichandran Ashwin who took 6 wickets each in the first and second innings respectively. Supporting the bowling line-up for India was Umesh Yadav who kept the pressure on the batsman. 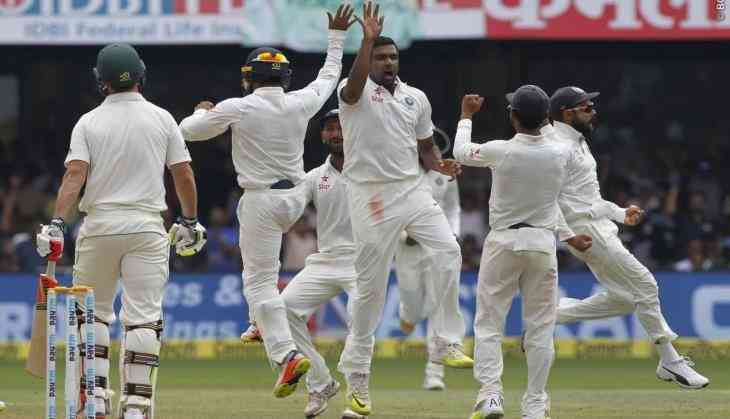 The flat picth did the trick for the Indian bowlers as the balls kept low which troubed the bastmen in the fourth day of the second Test. Scoring the highest runs for India was Cheteshwar Pujara who went back to the pavilion for 92 runs. The partnershp between Rahane and Pujara helped team India salvage the match and give the visitors a mere target of 189 runs which proved difficult due to the pitch conditions. KL Rahul was adjudged the Man of Match for his half centuries in both the innings. India had scored 189 in first innings after opting to bat. In reply, Australia scored 276 in their first innings, taking a lead of 87 runs. Hazlewood bowled his heart out with the second new ball, which was taken after 80 overs. Trailing 0-1 in the four-match series, India were overnight 213 for four with Cheteshwar Pujara, who would eventually fall for 92, batting on 79. Hazlewood took the prize wickets of Abhinav Mukund, skipper Virat Kohli and Ravindra Jadeja yesterday and dismissed Pujara, Ravichandran Ashwin (4) and Umesh Yadav (1) in the fourth morning. Bowling in tandem with Hazlewood, Starc rattled the Indian middle order by bagging the wickets of a well-set Ajinkya Rahane (52) and Karun Nair (0) off successive balls. The last wicket was taken by Stephen O'Keefe when he removed Ishant Sharma for six off 28 balls, ending a dogged 16-run partnership. Pujara and Rahane added 25 runs this morning before Rahane was trapped in front of the wicket by Starc. Local lad Karun Nair, who had scored a brilliant triple century against England, failed for the second time in front of his home crowd as he was cleaned up by Starc. Pujara was next to go as he was caught at gully by Mitchell Marsh off Hazlewood with the total reading 242 for seven. In the same over, Ashwin was cleaned up by Hazlewood, and Ishant Sharma and Umesh Yadav did not survive long. Shah Rukh Khan and Aamir Khan to team up soon. But is it for a film? READ NEXT >> Shah Rukh Khan and Aamir Khan to team up soon. But is it for a film?